It’s often difficult to know the difference between the two main types of bipolar disorder. It can even be difficult for health care professionals to explain unless they have had special training on the topic. When you know the facts, you can see that the difference between the two is actually quite simple. What is the difference between full blown mania and hypomania? Full blown mania if untreated usually leads to a hospital stay- especially if it’s someone’s first episode. This episode often starts in the late teens and early 20s. The mania can start off mildly with a sense of creativity or agitation and then spin out of control very quickly. When my partner Ivan had his first full blown episode it started with agitation and confusion, then moved into a complete behavioral change as he started to talk more than usual and couldn’t hold a coherent thought. The night before he went into the hospital, he wasn’t able to remember how to write a check or even have a normal conversation. He was seemingly very creative, but it was agitated and not fun and very scattered. He talked over people and moved around very rapidly. His face looked different and he talked with a different voice. He had what is called dysphoric mania- in other words he didn’t feel very well! This mania was accompanied by severe psychosis and he stayed in the hospital for over two months until the mania came down. I write about this experience in all of my books. Euphoric mania is the opposite of dysphoric mania. When it’s full blown, it’s very dangerous as it feels so good. The person almost always refuses help when they are really euphoric. When a person has euphoric mania, they feel no pain and have no reasoning ability- and most importantly, they can’t see the consequences of their behaviors as they feel invincible. This is very, very dangerous mania as it can just seem like excessive enthusiasm, creativity and charisma from the outside. Many liken this type of mania to a cocaine high. All full blown manias lead to disasters if they are not caught early enough and many people go into a deep depression after the mania if medications are not successful. Hypomania is much less intense and doesn’t put a person into the hospital, but it can still be very dangerous. As with full blown mania, a person can have either euphoric or dysphoric hypomania. Psychosis is not present with hypomania- though it’s common to have grandiose thoughts that seem like psychosis. I get euphoric mania at the beginning of my hypomanias. Nothing feels as good as euphoric mania- absolutely nothing- but I always do something stupid and I always crash. I work very hard at preventing hypomania by using my Health Cards so that it doesn’t sneak up on me. It is essential that you have a distinct diagnosis of either Bipolar I or Bipolar II as the treatments for the two can be quite different! For example, the mood stabilizers Lithium, Depakote and Tegretol are medications use for full blown mania while Lamictal is often used for depression with hypomania. No matter what form you have, the mania is serious- you can make horrible and life altering decisions when you’re full blown manic or even hypomanic. Prevention is the only way to make sure this doesn’t happen. What’s next? If you haven’t already done so, sign-up in the upper-right side of this page for your free copy of my Top 33 Daily Management Tips and Your 1st Step to Creating Stability: Acceptance, along with my weekly Bipolar Happens! 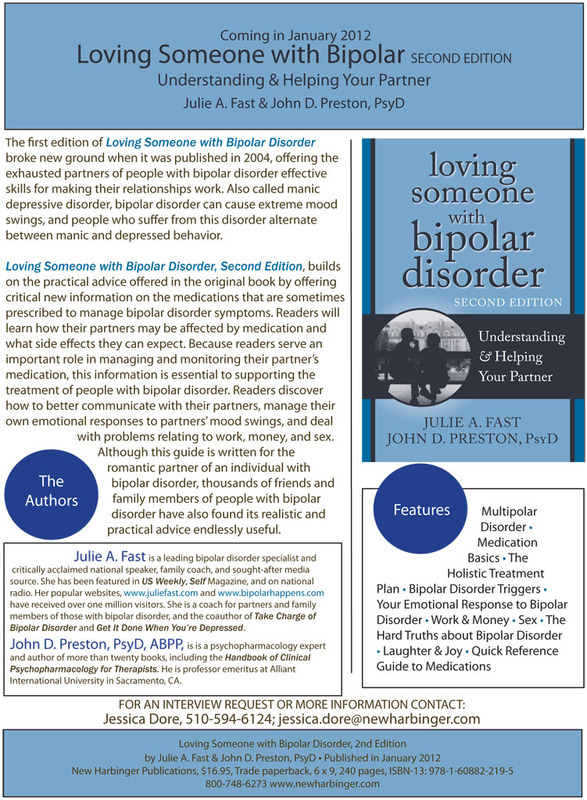 E-zine providing practical help for managing bipolar disorder.